Alliance for Accountable Governance (AFAG)is a political pressure group in Ghana. 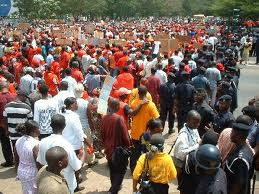 He said AFAG holds the opinion that, the Ghanaian can no longer be burdened for the luxurious provisions, system inefficiencies and capital management flaws of the Volta River Authority (VRA). AFAG called on the PURC to organize a consumer forum as a matter of urgency for deliberations on utility tariff increases in the country. He also said AFAG will communicate to the public their next line of action within two weeks.